Four months of protests in Sudan have helped end Omar al-Bashir's three-decade grip on power and prompted the resignation on Thursday of Awad Ibn Ouf, the head of the transitional military council. Here is a timeline of the upheaval in the country. Hundreds take to the streets in various cities on December 19, 2018 to protest the government's tripling of bread prices, some chanting, "No to hunger". The demonstrations spread and broaden into calls for Bashir's iron-fisted regime to quit. Offices of his ruling National Congress Party (NCP) are torched in several towns. The protests reach Khartoum on December 20, demonstrators chanting "freedom, peace, justice". Clashes break out as police try to disperse the crowds and eight demonstrators are killed in two cities. Bashir breaks his silence after six days of demonstrations, vowing "real reforms" on December 24. On January 1 this year, 22 political groups call for a "new regime". On January 9, thousands chant support for Bashir in Khartoum. But in the capital's twin city of Omdurman, there are more deaths in anti-government protests. On January 13, protests spread to the war-torn western region of Darfur. On February 21, security agents arrest several opposition activists as protesters try to march on the presidential palace. Bashir declares a nationwide state of emergency on February 22, also dissolving the federal and provincial governments. Two days later, he swears in a new prime minister as riot police confront hundreds calling for him to resign. On March 1, Bashir hands his powers as chief of the ruling NCP to his deputy. 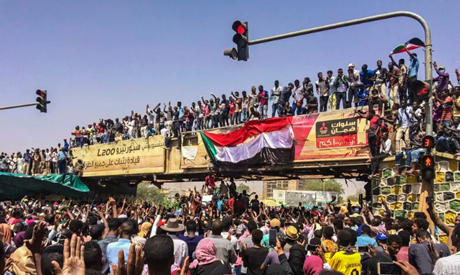 On April 6, thousands gather for the first time outside the military headquarters in Khartoum and chant "One Army, One People" in a call for support from the armed forces. They set up camp at the complex, which also houses the president's residence, defying attempts by police to dislodge them with tear gas and gunshots into the air. On April 9, police follow the military's policy of non-intervention and order their forces not to take action against demonstrators. State media report that 11 people including six members of the security forces have been killed in one day, raising the official death toll in the weeks of demonstrations to 49. On April 11, the sixth day of the sit-in, Defence Minister Awad Ibn Ouf announces on state television that Bashir has been removed from power and detained. He says a transitional military council will replace Bashir for two years. The country's borders and airspace are shut and Ibn Ouf announces a night-time curfew. Later that evening he is sworn in as chief of the military council now in charge. A furious opposition accuses the regime of keeping in place "the same old faces" and demand civilian rule, a call backed by the United Nations, African Union and Western nations. Thousands defy the curfew overnight into Friday, remaining camped outside the army headquarters, some chanting "peace! justice! freedom!" Addressing the media on Friday, the new military leaders pledge talks with "all political entities" on forming a civilian government. They also warn they would "not allow any breach of security anywhere" and rule out Bashir's extradition on an arrest warrant by the International Criminal Court to face genocide and war crimes charges. In the evening Ibn Ouf announces on state television he is stepping down and names General Abdel Fattah al-Burhan Abdulrahman to succeed him. Crowds of Sudanese celebrate in the capital.